Atty. Paula Alvarez, PDP-Laban designated spokesperson for leading presidential candidate Rodrigo Duterte, has engaged in a verbal tussle with Senator Antonio Trillanes. 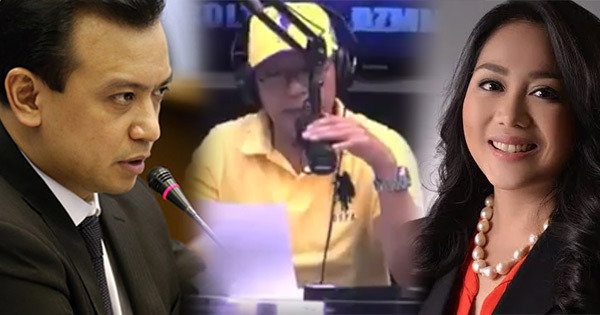 The argument between the neophyte lawyer and the ex-mutineer-turned lawmaker was aired live via phonepatch on AM radio station DZMM and over DZMM Teleradyo during the program of veteran news anchor Ted Failon. Atty. Alvarez dared the senator to execute an affidavit and disclose the source of the documents he obtained showing Duterte's bank account at BPI Julia Vargas branch allegedly containing P211 million. The young lawyer said Duterte has agreed to make his BPI bank account public under one condition. Citing the rule of law, she said Trillanes should first file a statement under oath. Trillanes said what Duterte is doing is all "drama." The senator refused the challenge and instead dared Duterte to sign a waiver to prove him wrong. If his allegations are not true, Trillanes reiterated that he will resign from the Senate and withdraw his vice presidential bid.